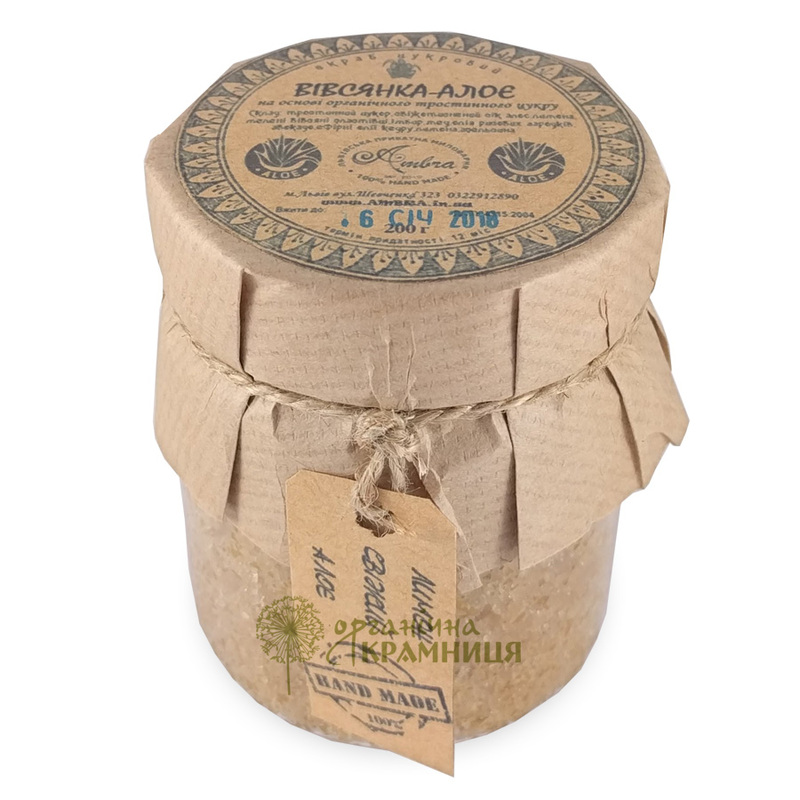 Oatmeal & Aloe Sugar Body Scrub is produced by the Ukrainian cosmetic brand Ambra (Lviv Private Soap Factory). The scrub is formulated with organic cane sugar and contains only natural ingredients of plant origin. Handmade. Free of colourants, preservatives, fragrances, SLS/SLES. The scrub cleanses the skin very delicately, yet effectively. It removes dirt and dead epidermal cells, improves skin elasticity, prevents cellulite and premature skin ageing. Its key ingredients are aloe vera leaf juice, lemon juice, ground oatmeal, ginger, honey, vegetable and essential oils. Cane sugar and ground oatmeal act as a delicate natural exfoliant. Ginger and honey have an excellent rejuvenating effect. They help to get rid of toxins, nourish and moisturise the skin, and produce an anticellulite effect. Aloe vera leaf juice is a great natural moisturiser. It also accelerates the healing of minor skin injuries due to its antiseptic and anti-inflammatory properties. Rice germ oil and avocado oil provide the skin with nutrients, stimulate its regeneration, improve skin elasticity, and make the skin soft and silky smooth. Directions. Apply a small amount of scrub onto wet skin, massage, leave for 3–5 minutes for a better effect, rinse thoroughly. Use twice a week. Ingredients. Sucrose (Cane Sugar), Citrus Limon Juice, Avena Sativa Kernel Flour, Zingiber Officinale, Mel, Oryza Sativa Germ Oil, Persea Gratissima Oil, Cedrus Deodara Essential Oil, Citrus Limon Essential Oil, Citrus Sinesis Essential Oil. Want to buy Oatmeal & Aloe Sugar Body Scrub? Call us or submit your order via our web site!